Artist's concept showing an impact that created the giant Rheasilvia crater on the protoplanet Vesta. Most of today's asteroids may have been created by such massive collisions long ago, a new study suggests. Asteroids have long been regarded as planetary building blocks. But they may actually be byproducts of planet formation, born when violent collisions smashed an earlier generation of objects apart, a new study suggests. Asteroid fragments that fall to Earth as meteorites often contain tiny, round pellets called chondrules that formed when molten droplets quickly cooled in space in the solar system's early years. Chondrules are found in 92 percent of all meteorites, and are often thought to be the building blocks of planets. Prior research had suggested that chondrules in some meteorites were probably born when rocks in space collided at speeds of more than 22,370 mph (36,000 km/h). However, it was uncertain how the majority of chondrules formed. Now, scientists have found that cosmic impacts could have generated enough chondrules during the first 5 million years or so of planet formation to explain the large quantity of these pellets. Part of a meteorite containing chondrules that was discovered near Tindouf, Algeria. "The most surprising implication of our work is that the meteorites we find on Earth are not actually the building blocks of planets, as has been thought for a long time," lead study author Brandon Johnson, a planetary scientist at MIT, told Space.com. "Instead, they may be a byproduct of planetary formation." Chondrule-bearing meteorites — known as chondrites — may thus not be representative of the objects that built the solar system's planets, study team members said. The researchers simulated impacts of varying speeds between protoplanetary objects about 60 to 650 miles (100 to 1,000 kilometers) wide. 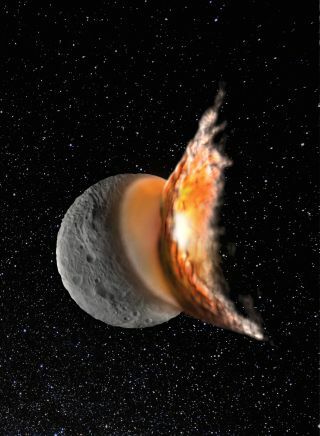 They found that when collision speeds exceeded 5,590 mph (9,000 km/h), plumes of molten rock that blasted out from these impacts could form millimeter-size droplets that could have cooled into chondrules. The scientists calculated that cosmic impacts within a typical protoplanetary disc could have generated more than 44 billion trillion lbs. (20 billion trillion kilograms) of chondrules. For comparison, the present asteroid belt currently has a mass of about 6.6 billion trillion lbs. (3 billion trillion kg). This finding suggests that cosmic impacts could have generated many of the chondrules in the asteroid belt from which nearly all meteorites originate. "We've put together a coherent model for chondrule formation," Johnson said. "Once we have a proper context for how chondrules formed, we can really understand what was happening in the nascent solar system." Johnson noted that the team's work only investigated vertical impacts. "More realistic impacts may be at an angle," Johnson said. Still, such oblique impacts "produce more jetted materials, more chondrules," he added. The scientists detailed their findings in the Jan. 15 issue of the journal Nature.